The 20-year mission is coming to an end later this month when the the probe makes its final destructive plunge into Saturn. 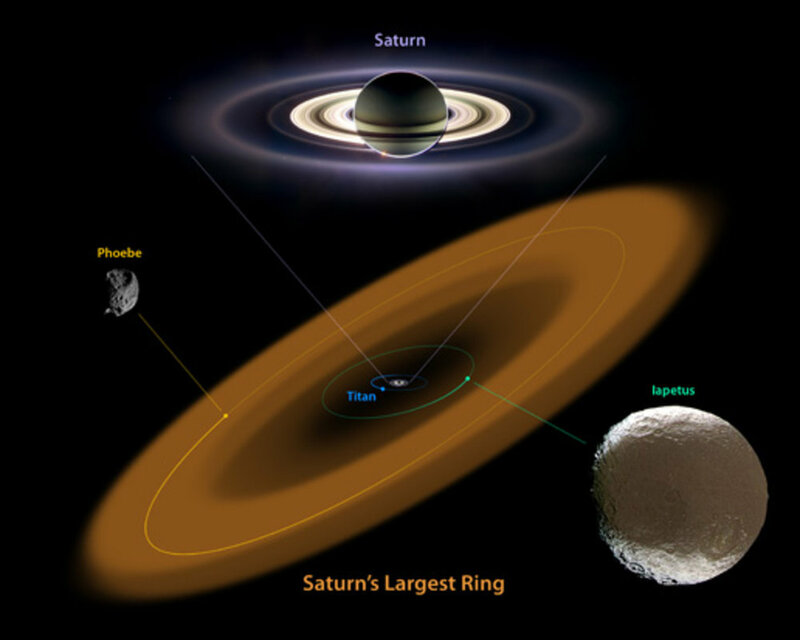 Thirteen of those years were spent orbiting the ringed planet, the second largest in our Solar System, exploring some of Saturn’s 62 moons, seven of which were discovered by Cassini. Titan, the largest of Saturn’s moons, is the only moon in the Solar System with a substantial atmosphere. In fact, Titan’s atmosphere is so dense that walking on its surface would be like swimming at the bottom of a pool here on Earth. In 2009, Cassini confirmed that Titan has lakes, clouds and rain – a “water” cycle of sorts, but driven by liquid methane. It’s so cold on Titan that water forms ice as hard as granite and is the stuff of mountains rather than rivers. Titan’s lakes are mostly found in the northern hemisphere, while mountains loom over Titan’s equator, suggesting tectonic and cryovolcanic activity at work. The two dark strips in the image below are dune-filled regions (or sand seas) called Fensal (northward) and Aztlan (southward). The big surprise for the Cassini mission was discovering that the small moon Enceladus, just 500km across, has all the right stuff for life – water, energy and nutrients, powered by hydrothermal vents deep on the ocean floor. In 1671 the Italian astronomer Giovanni Cassini discovered Saturn’s third-largest moon, Iapetus, only to have it briefly disappear before becoming visible again a year later. He surmised that Iapetus might have two contrasting sides - one bright and easy to see, the other so dark to render it invisible. More than three centuries later, the Cassini spacecraft revealed the reason why. The dark side of Iapetus is coated in dust from Saturn’s outer moon Phoebe. Iapetus and Phoebe orbit in opposite directions with Iapetus ploughing into debris ejected from Phoebe’s surface. This debris forms an incredibly dark but giant outer ring around Saturn that follows Phoebe’s orbit and is tilted relative to the planet’s main rings. Cassini showed that the dust covering Iapetus slightly raises the temperature on that side so that ice cannot settle there. This means dark spots become darker, while water vapour transfers to the moon’s other side making it even brighter. That’s how Iapetus maintains its dichotomy. What’s more, as seen in the Cassini flyover below, Iapetus also has a mountainous ridge that runs more than three-quarters of the way around the moon’s equator. Due to its location and the very steep slope of its peaks it has been suggested that Iapetus may have once had its own ring of debris which has since collapsed down onto the moon, creating the ridge in the process. Saturn has seven major moons with diameters of 400km or more. Besides Titan, Enceladus and Iapetus the list also includes Mimas, Tethys, Dione and Rhea. Any science fiction fan will recognise in Mimas a resemblance to the famed Death Star from the Star Wars movies. The feature responsible for this resemblance is the Herschel crater, nearly 140km wide or about a third of the diameter of Mimas. If the impact had been any bigger it might have destroyed Mimas completely. Rising from the centre of the crater is a mountain that’s almost as tall as Mount Everest. Tethys also shows the scars of a major impact and to put it into perspective, the Odysseus Crater on Tethys (seen on the left image above) is as wide as Mimas. On Tethys’ opposite side is the Ithaca Chasma, a deep canyon that runs the majority of the way around the icy moon. The Cassini spacecraft flew close enough to the icy moons Rhea and Dione that it could sniff their tenuous atmospheres and discovered evidence of oxygen. The oxygen is at levels 5 trillion times less dense than Earth. It appears to be released by sunlight or energetic particles hitting the moon and breaking down the water ice on the surface. Hyperion may not be one of Saturn’s major moons, but it certainly has an appearance that’s out of this world. The moon is highly porous and has a very low density. It’s thought that any impacts simply compress the moon, just like sticking your thumb into a sponge to mould the surface.